90th Infantry Division Pic of the Week: Kelberg, Germany. Pitching in! 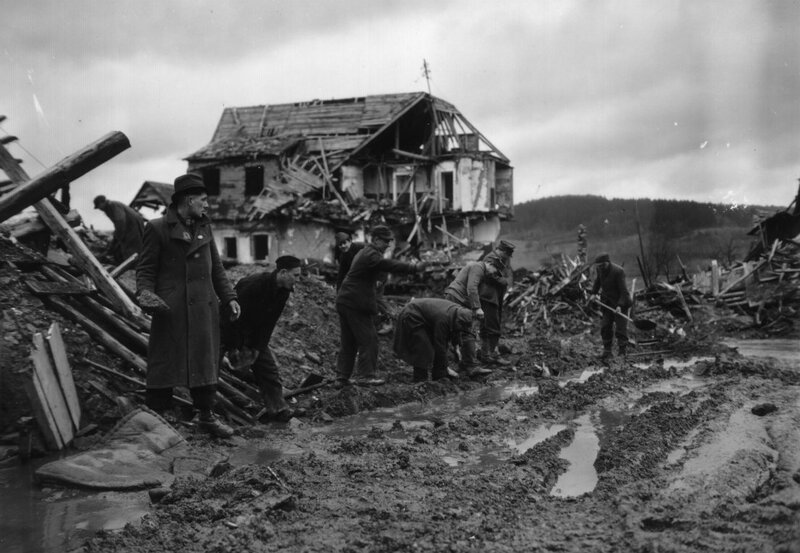 In this edition of the 90th Infantry Division Pic of the Week, we feature a shot of recently liberated, former Polish POWs, lending a hand to keep a well-used American route to the front operable. This is for me a very interisting Place behause is my birthtown. At this Place is today a crossroad and new Houses and the Center of this litte Town with ca. 1100 inhabitant. At the Place from the damaged House in the Background is a closed Hotel and in the past a Pizzeria. Have you more picture’s ? And in higher solutions? Or the a Story to this picture’s? Great to hear from you, and thanks for your comment. Let me check our files to see what else, if anything, we might have on Kelberg. that´s for me a very importent picture for me and the other inhabitant. Because at the 16th of January 2015 is in Kelberg the 70th year commemoration day bombing from Kelberg in 1945. No more War that the message. PS: Today at this place is a crossroad were the house is a closed hotel/restaurant. PSS: Its possible to become the picture in higher solution for the city chronicle? have you find other Picture from kelberg ? Can i bye the Picture in a higher solution? Is it possible to become the picture in higher solution for the city chronicle?